John O’Halloran, Helen Montgomery Leane Verhulst, and Chris O’Halloran, ready for business on Day One. It was an incredibly brilliant experience. We benefitted hugely from teamwork and generosity of fans. 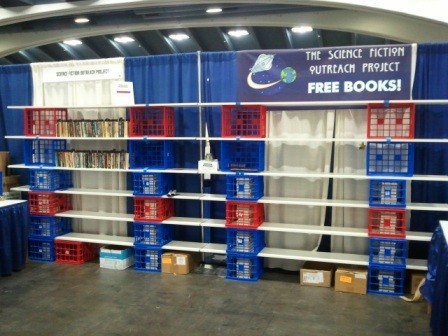 Between a variety of book drives, donations and even people turning up at WonderCon (April 1-3) with small bags, we had between 5,500 to 6,000 books. Borderlands, Berkshire Books, Locus Magazine, and Half Price Books (in both the Bay Area and the Chicagoland Area) also donated books. 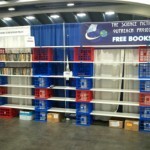 We had boxes of Locus and SF and F to give away as well. We had bookmarks made, and every book had one inserted prior to shelving. 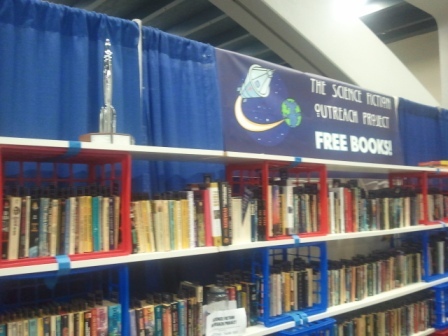 We were able to shelve around 1400 books at a time in the space we had, and had stacks of flyers for other cons on both tables, promoting a wide variety of cons as well as progress reports for Renovation. We set up on Thursday, after spending Monday through Wednesday sorting books, picking up books, and then loading a truck, etc. On Wednesday after loading the truck, we popped into the Moscone Convention Center, and this was fortuitous as we got our badges and met our contacts, and they were real nice. Thursday we built our shelving, the Freeman move-in experience was a good one, as was the whole set up. Friday — well it was interesting, we were all set up and within minutes of opening our booth area had about 6 people in it, and from then till close we never had less, and frequently had too many. This was the pattern for the rest of the weekend as well. A continual information dump from the team (we had 7 on hand at opening and this increased throughout the weekend) to the attendees, and then longer time taken to explain what cons are (I know, but wow – you should have seen their faces when they realized what else is out there! 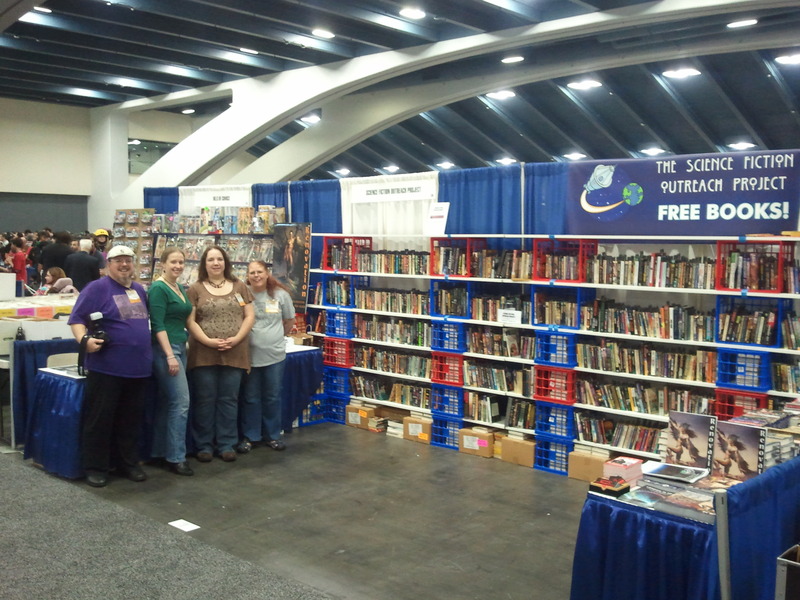 ), what Reno is, what Worldcon is and what we were doing meant at all times we were busy. 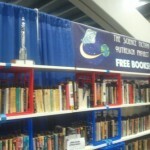 There was much interest, and people from the Bay Area, Sacramento, and Reno especially interested in the World Science Fiction Con coming to somewhere nearby or Westercon or Loscon, while folks from further afield were pointed at cons in their states and generally anyone who wanted to know about something local to them was satisfied. 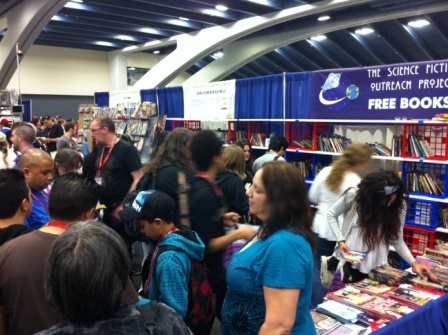 The diversity of people calling into the booth was much more varied than our experience at book conventions, and yet all folks wanted to do was talk about books, get recommendations or talk about these “book conventions” that we were promoting. 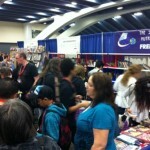 Everyone was super friendly (well, the books were free) but the interest in the overall hobby was noticeable. 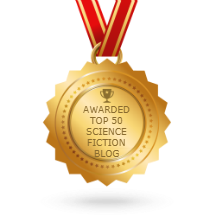 Also, the knowledge of people was superb, many of these people were genuine SF readers – who just are not aware of what’s going on in the SF fannish community. Friday we cleared the bookshelves, and on Saturday and Sunday both days we refilled throughout the day and managed the books well, and so by Sunday night we ended up with only 80 books not taken. It was real hard work, it was an incredibly fun thing to engage with people about books and our wider hobby and we are pretty sure we can call it a success. Helping out the core team were: Dave Gallaher, Dave Clark, Mike Ward, John O’Halloran, Chris O’Halloran, Kevin Standlee (who brought a Hugo statue for us to display! ), Steve Libbey, Tom Becker, Lynda Wentzelberger, “Hitgirl” (a random attendee who decided what we were doing was cool and started to help), Jo Mead, and Leane Verhulst. We would also like to thank Kimm Antell and Meredith Branstad for helping to design bookmarks and postcards and banners for us. It was quite honestly one of the most amazing experiences some of us have ever had in fandom. WonderCon is only just over – but we’re already gearing up for what comes next! We have a few ideas of what we would like to do, and will keep the readers of File 770 updated as we go. We cannot thank you all enough for your support, it was a great weekend. I truly believe we got our message out and in a good way, and that fandom will benefit from this for sure. Day Two, with Hugo rocket. The final remains on Day Three.